And what does Wednesday mean? I love the cinema, but maybe, just maybe, I love the popcorn more. Popcorn is my kind of treat. However sometimes, the getting to cinema just seems too much effort, but fear not, with my recipe for popcorn as delicious as Ed Westwick, a home movie will be just as good! In a large saucepan, pour in a thin layer of oil, just enough to cover the bottom of the pan, and heat on a medium temperature until its hot but not smoking. Then add in the kernels, swirl to cover all of them in the oil, then put on the lid and wait for the magic to happen! The kernels should start to pop- first one scared the living daylights out of me! Once all have popped, transfer to a bowl to cool down. Now in another pan, heat the sugar and syrup together until completely dissolved. Next add in the peanut butter until completely melted in. 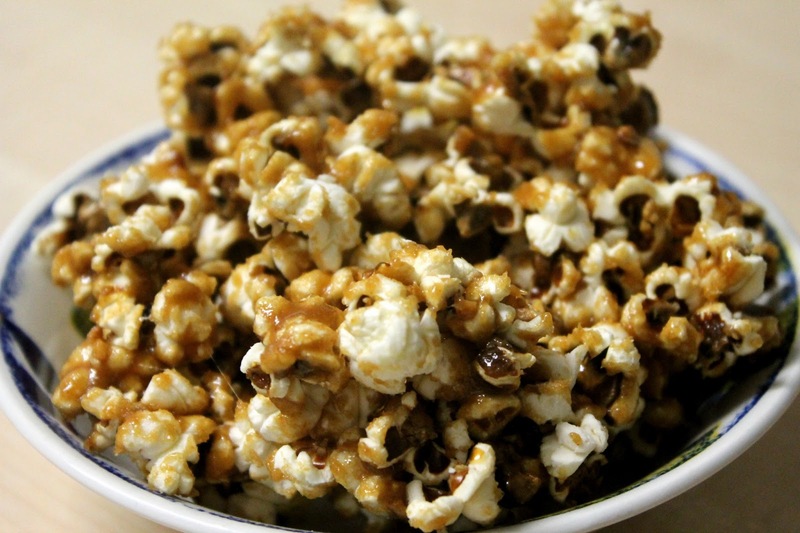 Finally, take off the heat and immediately pour over the popcorn and start to stir and cover all the popcorn quickly as it sets fast. Now, you can either let it cool completely in the fridge for a while so it sets, or I quite like to heat it up in short bursts of 15 seconds in the microwave for that ooey-gooey goodness... a bit like Ed really. Oh my goodness this look DELICIOUS. Must try! P.s. I tried pinning your recipe but it says your images can't be pinned? Oh really? That's strange, are you using the pin it button that you have attached to your favorites bar?